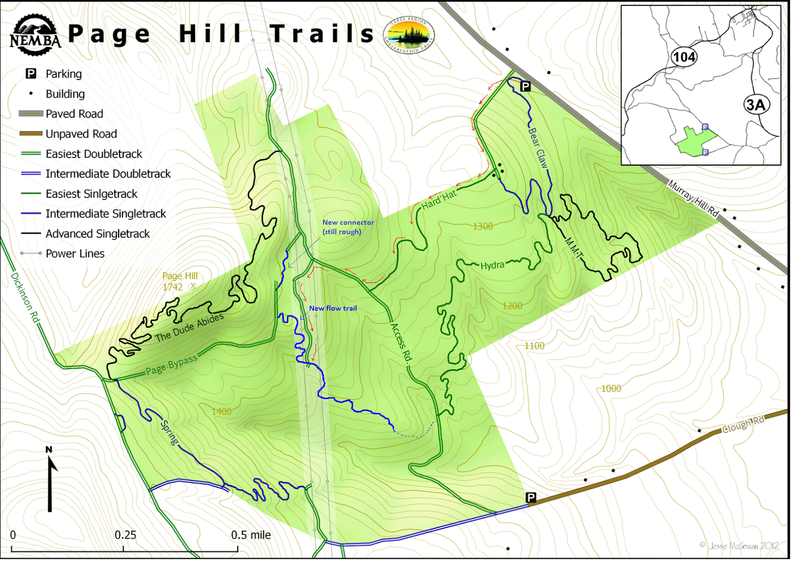 We are starting construction of a new trail at Page Hill on Sunday 9/14. 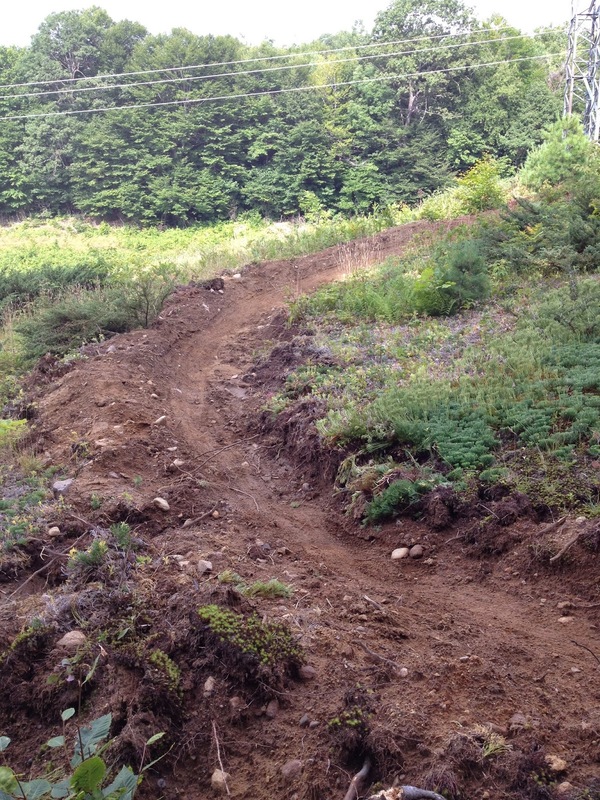 This new singletrack trail will run from near the bottom of Shock Therapy to near the bottom of Spring. Registration will be from 8 to 9 am at the top of Clough Road. Directions can be generated at this link. The project is nearing completion, but we are looking for your help to put the finishing touches on and to help us ride it in. Please join us This Sunday. We will be out there from 8 AM to 4 PM, but feel free to come by any time, even just for a test ride. We have tools out at the work site so just bring your bike, work gloves and water. Since we are focused on completing the project this will be a no-frills trail day. Don't expect the usual staffed registration table with coffee and donuts. We will already be out in the woods digging! 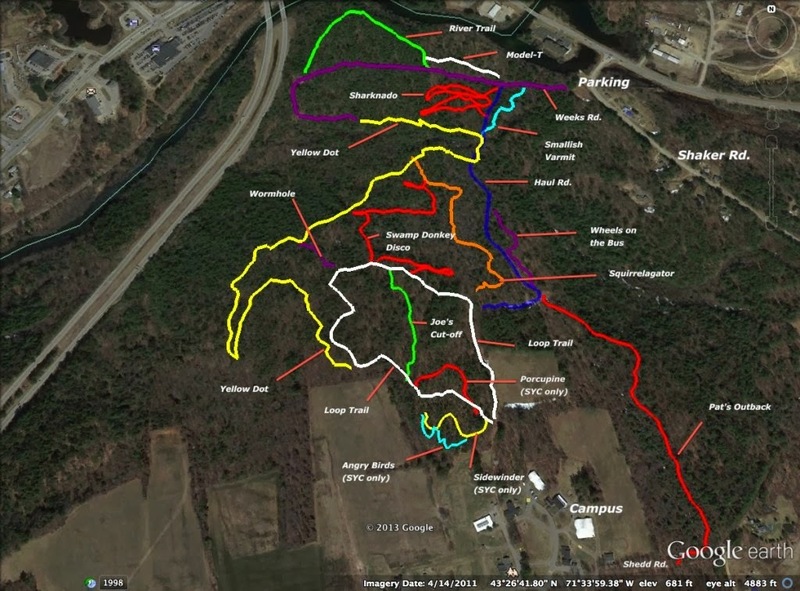 The map below shows the new flow trail. The solid blue line is for the completed section and dotted line for the section remaining to be built. The quickest (but not the most fun) way to get out to the new trail is shown with red arrows. This will bring you to the middle of the completed section of trail. From there you can ride or push up to the top. In other news, its possible to link Franklin Falls, Highland XC and Spaulding Woods in a somewhat reasonable manner. If you do just about all the single track at each location you end up with about 20mi of trails with about 18-19mi of connecting on pavement/dirt road/jeep road. 50/50 trail to pavement is a pretty good ratio if you ask me! Registration will be at the main parking lot on Murray Hill Rd from 8:30 to 9:00 AM. 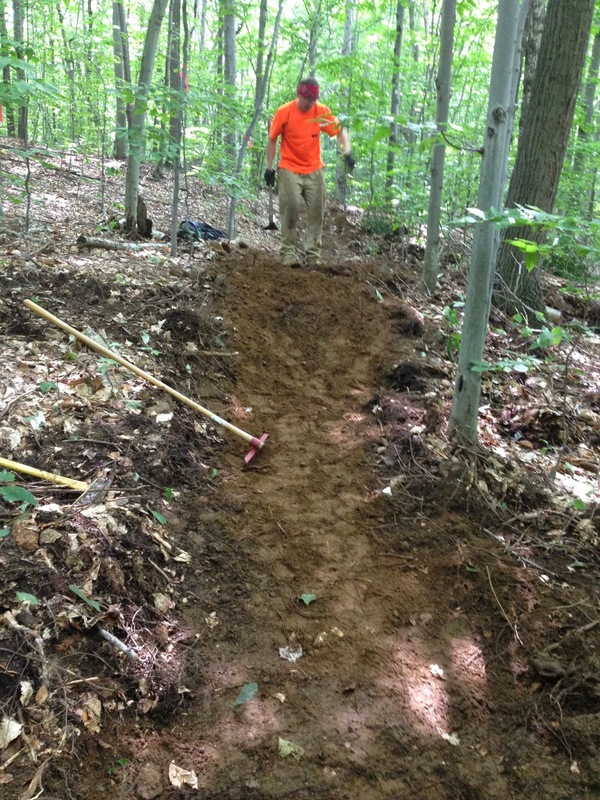 Trail work will be from 9 am to 2 pm. NEMBA will provide water, snacks, and tools. 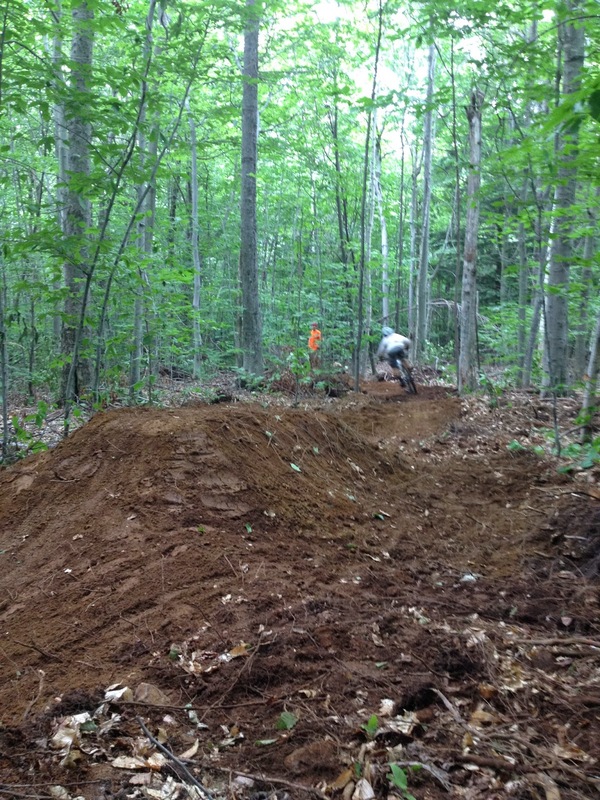 We have several minor improvements planned for Bear Claw trail, including berm'ing a few corners and adding some fun features. Trail Day was a huge success! Seventeen volunteers showed up and we completed just about everything on the agenda, plus some extra bonuses. 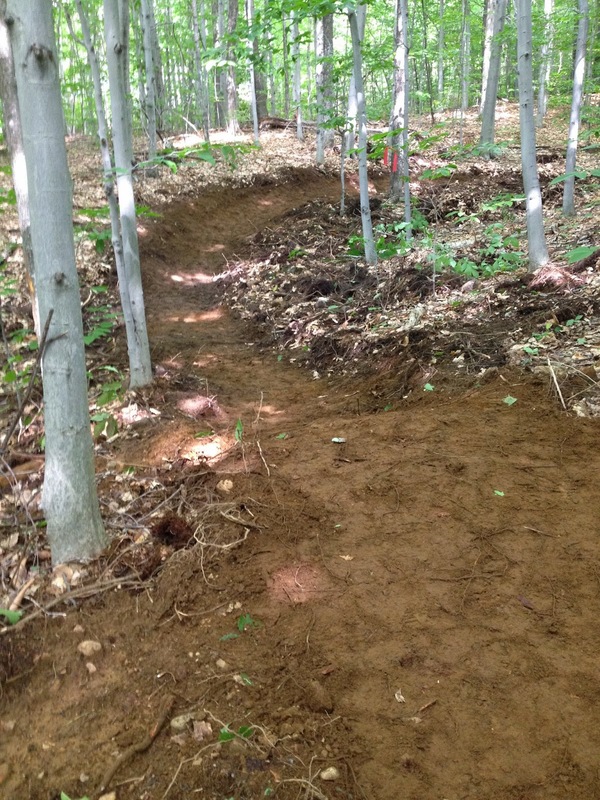 With the exception of installation of a bridge, a new trail was completed that gives a bypass option for the steep hill between Rusty Bucket and Cellar Hole Trails. The crew knocked out the trail bench in short order. Our prefabricated bridge was stranded when the Beltline Road flooded late Saturday night, as the surge from Friday nights heavy rains raised the reservoir level over 3 feet. When the water recedes we will be able to retrieve it and drag it to its final destination. Thanks everyone for a great effort! Glenn Cilley and Chris Schoeder provided great leadership for the team along with a healthy dose of sweat equity. Eric Lovering was a bench cutting machine. Veterans: Grant Drew, Mike Henderson, Scott Pelletier, and Barry Hersh also contributed needed muscle and knowhow. The turnout of new faces really made it happen fast. At least six new folks lightened the load. I was bouncing between crews and unfortunately, I didn't lock all the new names in my brain. Hope I have more opportunities in the future to get to know everyone better. 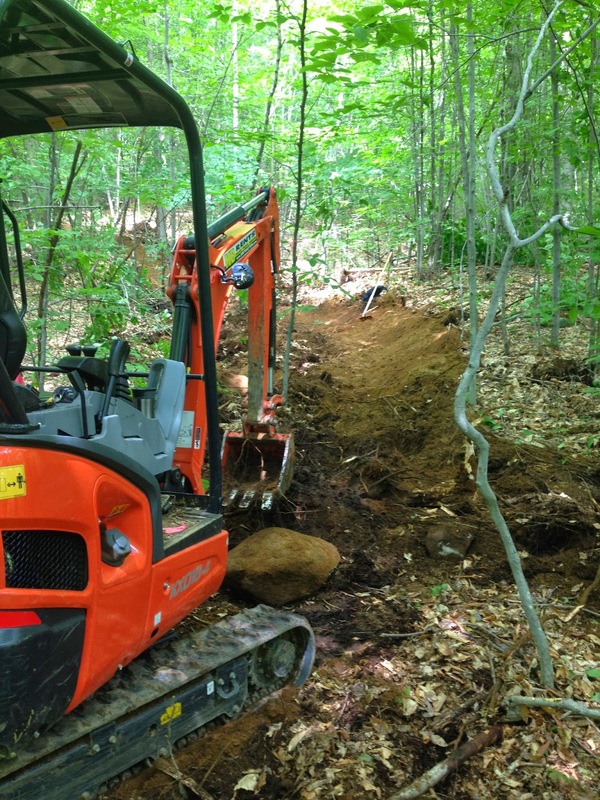 After completing the new trail, Eric and Glenn turned their attention to giving Salmon Brook some much needed attention. Erosion damage on the switchbacks and connecting benches was repaired. The pictures look great, looking forward to getting some wheels on it. While the main crew worked on the new bypass trail, Jesse McGowen and Chris Rodger moved a few tons of dirt to reconstruct the finish line jump at the end of Mighty Chicken. The switchbacks were also de-rooted and smoothed. Yet other volunteers armed with leafblowers, cleared existing trails of winter debris. Among them were Matt Bowser and Matt Clark. 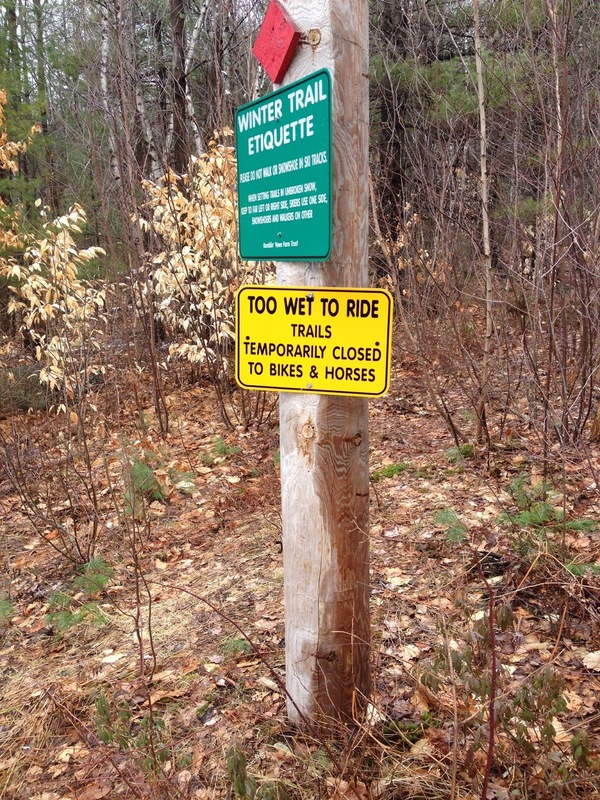 Ramblin' Vewe has pulled the signs and all trails are open and ready to ride! Get out there! We are very close to being clear of mud season but a few spots persist and no matter how bad we've got the itch its important to respect our land manager's wishes and stay off trails until they are ready. Trails closest to the parking lot are riding fine but please give the stuff up top a bit longer to dry out. They will be updating their website as conditions change so keep your eyes peeled. You know the drill everyone. The snow is melting, we are all itching to get on dirt but we have to use our heads this time of year. We had a more substantial snow pack than we've had in the last few years so its probably going to take a bit longer for the trails to harden up this season. Ramblin' Vewe Farm is officially closed to riding and has signage on site that we all need to respect. Even if things are getting closer to being ready, if the signs are up do the right thing and save it for another day. "First Hand Report on Franklin and Spaulding-today at noon-- Lots of snow and ice at Franklin, that's about 50-85% snow and ice coverage-ice up to 4" deep on Snowmo trails/roads and singletrack, compaction here. I walked Coleman Road and came down Sniper, my adopted trail. What is not snow or ice, is mud--- the fabled drainage at Franklin is still frozen below the surface from the 5 degree below normal Winter. Some of the snow is still 8-16" + deep. Sniper was a ribbon of ice from Winter compaction.So when the snow and ice go, another week at least, we will still have mud. And Lots of branches and debris from a stormy Winter. Two weeks looks better unless it is 70, blue skies, above freezing at night. It could be May 1...ditto Spaulding--I drove down to the parking lot, and saw the same amount of snow as Franklin--have pics of today if I figure out how to post them." So be smart. Stick to the road or class VI or take this opportunity to visit some friends down south. 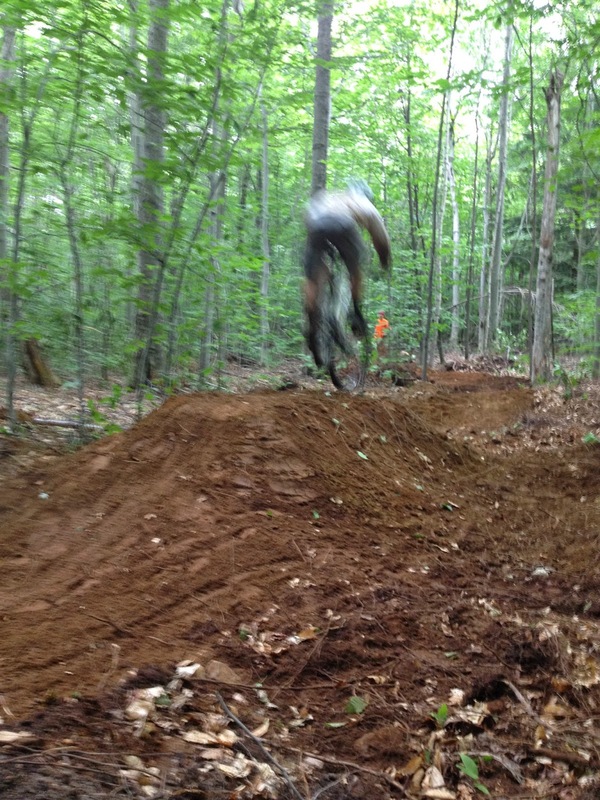 Many ride spots are already riding well down in MA and southern NH. We'll update here as things get better in our area.